The Firm – I first picked up this book in a bookstore at the airport, and it seemed quite interesting. I did not give in to the impulse purchase and forgot about it. A couple of days later I bumped into an article about the book, and I immediately knew I had to read it. 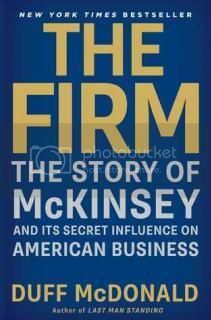 The title of the book, The Firm: The Story of McKinsey and Its Secret Influence on American Business, is self-explanatory. McKinsey has always intrigued me, and I always used to wonder the reason an organization (Mc Kinsey’s client) hire such expensive services. Why could a company just not hire the people? That would be so much cost effective. I still remember the long debate with Doc about the futility of hiring a consultant. This was during our campus days just after we had returned from our summer internships, and Doc had interned at McKinsey. Like a good consultant, we concluded the argument with “it depends”. The Firm (this is how the company refers to itself) was started in 1922 by James Mc Kinsey, by decoding the story within the accountant’s ledger. This led to the beginning of a new industry – consulting. Companies were now ready to pay a hefty amount to someone from outside, who would tell what to do. The book captures the history of the firm, right from its humble beginnings in the 20’s to the present day in elaborate detail. Having said that, this is not just a company history book, it delves into the evolution of the consulting industry in general and its ways of working. The Book is full of anecdotes throwing light on the various engagements and the background role of McKinsey in many historic decisions. Like in the 1970’s, McKinsey was such a big item in Tanzania’s finances that Tanzania was paying the firm so much amount that it was a line item in the country’s budget. In spite of the huge expense, the tyrant ruler of the country (who had hired McKinsey’s services) ran the country into the ground. These and many such examples make it for quite a rich reading. Now, these recommendations would probably be just what the company in question would have right in the beginning, but the McKinsey approval now gives it a complete legit turn and makes it much easier to drill down through various levels of the hierarchy. The book also deals with the controversies that have surrounded the Firm – right from the initial days of organizations restructuring where it implemented the same structure one company after another, to the latest scandal involving Rajat Gupta. The author Huff Mc Donald, has put in a lot of effort in reaching out to the various sources possible, and referred to countless works. Especially in dealing with such a firm, which prides in its secretive way of working? Overall, this Management book is a good read for anyone with an interest in to know the inside world of consulting and the origins of the company credited with establishing the industry.